Las Vegas, the city I love. My style. I study the artistic stone, design my piece and name it depending on what it reminds me of. The beautiful stones, beads and crystals inspire me to create unique pieces. Sterling silver wire, gold-filled wire, beautiful stones, beads and crystals. 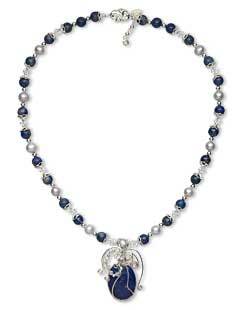 The lapis and silver reminds me of the sun shining on the sea. 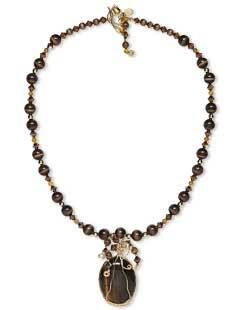 The tiger eye reminds me of a tiger in the hunt in Africa. My creations define themselves once I begin my designs. My interest in designing and creating wire jewelry was sparked by a beading class. I have taken five classes and am still changing and improving. Yes, mostly in home décor and clothing. I enjoy reading spiritual and healing literature. I work on self-improvement, health, happiness, peace, success and positive energies. Not yet, however three of my closest friends and I get together often for jewelry days and share information. I am just getting started. I will be marketing my jewelry and have a website shortly. I have a lot of ideas on marketing and I am taking business classes. I find creating my jewelry very rewarding, fun and peaceful. Not yet, but I am interested in participating in the near future. Go with what feels good to you, everyone's design is different, yours is as good as anyone else's. And always strive to move forward, try new things. View all of Christy's designs in the Gallery of Designs.